Veena is an Indian plucked string instrument which is seen in the hands of goddess Saraswati. These veena are available in different colors because of their manufacturing with different wood. These have got strings which produce sweet musical sound when stretched. Veena is one of the oldest musical instrument which was widely used in ancient times as well. Veena is made from a Single log of wood.The tonal quality of the instrument is much better than the joint veenas. Being a customer oriented organization, we are deeply engaged in offering a wide array of Ekanda Veena. We would like to offer our clients with an extensive array of veena. These are known for their reliable performance for a longer period of time. These are designed in accordance with the international standards. These can be obtain for us at reasonable price. DL Exprts and Imports are Exporters, Suppliers and Retailers of Veena. We have large varieties of veenas of Bobbili, Nuziveedu and Tanjavur areas. Among the Indian instruments, Veena is one of the most revered and ancient instruments. We have pattern rights for Tanjavur veena. The Vichiter Veena has four main strings three front side supporting strings and along with two chikaris, 15th"Tarabs (resonance strings) having a range of three and half octaves. Resonance strings confine a player to "pure" or "perfect" note as they themselves are tuned on "perfect"." Being a leading firm in this industry, we are deeply engaged in offering a high-quality range of Saraswati Veena. We are engaged in offering Veena, a musical instrument used for playing Indian classical carnatic music. The veena produces a sweet soothing sound. This instruments come sin different colours and in a combination of strings. It is manufactured using high quality wood. The back of a Veena work as a resonator and is made of hollow wood, usually from jackfruit tree. 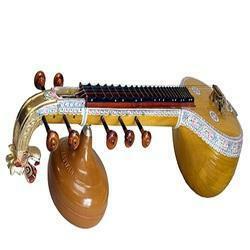 Veena Instrument is a stringed instrument and used mostly in carnatic Indian classical music. It is one of the oldest musical instrument and manufactured using quality & different wood. This instrument is available in different colors and also integrated with strings, which is stretched to produce sweet music.